While toothpaste is not absolutely necessary to use with a toothbrush to maintain proper oral hygiene; dentifrice, the technical term for toothpaste, does offer benefits that substitutes like salt, baking soda and peroxide do not. Commercially available toothpaste (at least those that have the American Dental Association’s seal of approval) has three main ingredients: a mild abrasive, fluoride, and a surfactant. Ingredients such as calcium carbonate or silica are added to toothpaste to function as abrasives to help better clean teeth and remove stains. Hydroxyapatite, a mineral formula that closely resembles tooth structure, is another abrasive used in toothpaste. The difference in home substitutes is that an abrasive like baking soda or salt may be too aggressive an agent to scrub teeth and may actually scour away tooth enamel or the softer less mineralized dentin and root surface. Fluoride is perhaps the most important ingredient in toothpaste, whether it’s in the form of sodium fluoride, stannous fluoride or monofluorophosphate. Topical fluoride (not meant to be ingested) helps teeth resist decay, and it can also remineralize early cavities and make the tooth “harder.” If a toothpaste substitute were to be used, some other source of fluoride would be recommended. Surfactants such as sodium lauryl sulfate are basically detergents added to toothpaste. They are the reason that toothpaste foams during brushing and enables the paste to spread easily over the teeth, thus increasing its cleansing action. Baking soda, which is one of the most common toothpaste substitutes, tends to dry up and cake on the teeth. Other common ingredients added to commercially available toothpastes include antibacterials like triclosan which helps prevent gingivitis and desensitizers such as potassium nitrate penetrate dentinal tubules and help reduce temperature sensitivity. Some people voice real concerns over the presence of artificial ingredients including sweeteners in toothpaste. FYI, there are more “holistic” toothpastes available that use only natural sweeteners but still have the fluoride, abrasives, and surfactants that are the workhorses in toothpaste. All in all, when it comes to caring for your teeth, the importance of ease of use and convenience cannot be overstated. Many patients have admitted that they’re just too tired at night to brush their teeth. Imagine if they had to concoct their own paste prior to brushing! 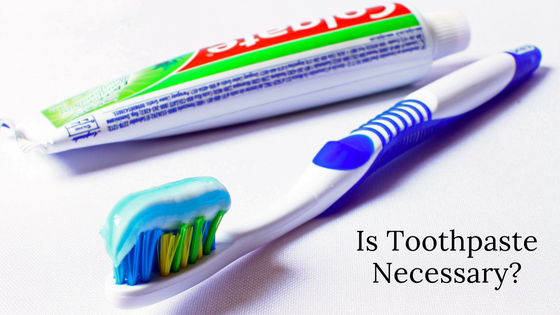 Is toothpaste absolutely necessary to properly care for one’s teeth? No, but, toothpaste does offer many advantages and benefits that home substitutes would be hard-pressed to duplicate. Sometimes it’s just nice to pass along tid bits of information that I think of as fun facts to know and tell. Glad you enjoyed it. Thanks for the info, Doctor! I have been scouring the internet for viable information from a Dental professional to inquire about this issue, and have found it at last! Much appreciated!